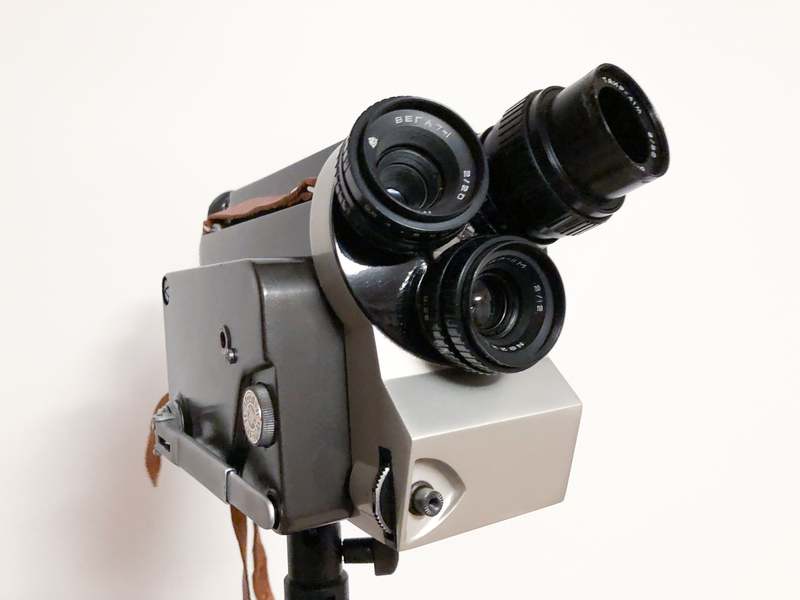 If you enter today “Kiev 16U” into a search engine, you will find in hundreds of articles the lenses of an unusual Ukrainian 16mm film camera: Mir 11-m, Vega 7-1 and Tair 41. Numerous Russian dealers unscrew them today from their ancestral camera housings to sell them individually and to convert them to digital cameras. Adapted to modern Blackmagic Pocket Cinema cameras, the slim fixed focal lengths actually deliver impressive picture quality. By contrast, nobody seems to care about the analogue camera from the city with the Great Gate. Admittedly, it was also my love at second glance, because the camera is initially reminiscent of a bizarre, armor-shaped insect with gas mask. But with the Kiev you have a special piece of the history of technology in hand, that inspires you: Solidly made, its 100 ft taking-reels, which are mounted one above the other and rotating in opposite directions. 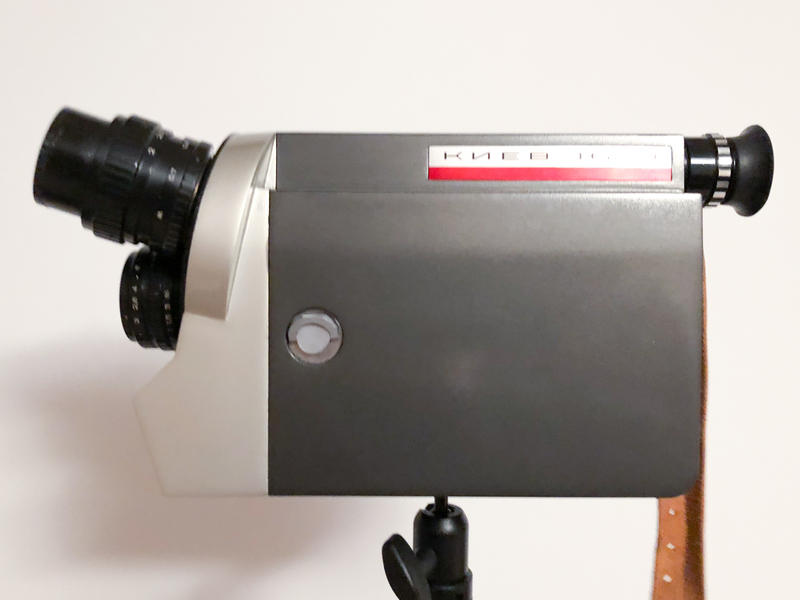 With a little imagination reminiscent of a Super 8 cartridge without plastic cover, the camera interior resembles thereby even something which the Logmar S8, which also leads the film with a loop out of the cartridge. You have one of the most compact 16mm cameras for 100 ft spools that fits into any standard pocket. One is quickly fascinated by the large viewfinder, although the eyecup for spectacle wearers is rather unfavorable. Using the crank, you can rewind the movie for trick shots, which I enjoy a lot. 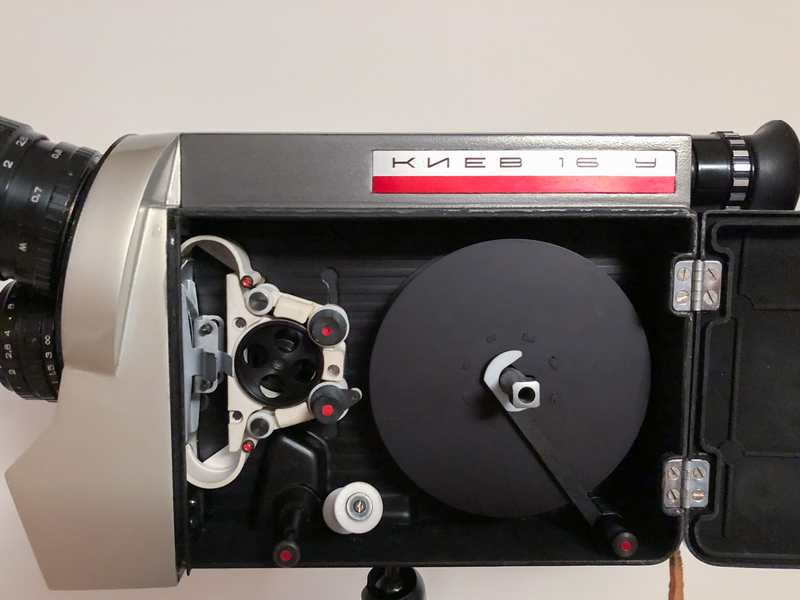 Who is still annoyed by fuzzy film loading the Krasnogorsk 3 and therefore (like me) has removed its loop former, the Kiev 16U is pure joy: the automatic film loading works perfectly. 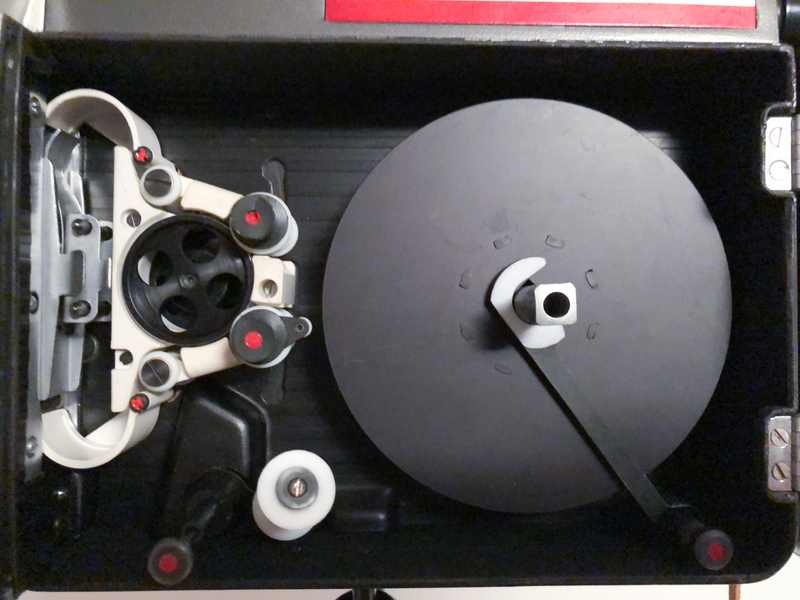 Once the film purrs out of the lower spool around the image window and then rushes over the pulley in the upper coil, one becomes again an astonished child. The image steadyness is impeccable, the weight just right to get even from the hand filmed quiet shots. Since the lenses are fixed focal lengths, are achieved even better picture quality than the already already good meteor zoom lens of Krasnogorsk 3. The spring drive motor is removable as a module and can be easily replaced by an electric drive of the Kiev 16UE. However, it is almost impossible to get a usable one, because you have to rebuild the battery case to today’s batteries, which requires some crafting skills. Anyone who thinks a 50-year-old camera can be used immediately is wrong. My first one I bought from eBay was hopelessly messed up and the distance to the lenses was not right anymore. Fortunately, I got a new camera body from a Russian acquaintance in top condition and have since no problems with the camera. 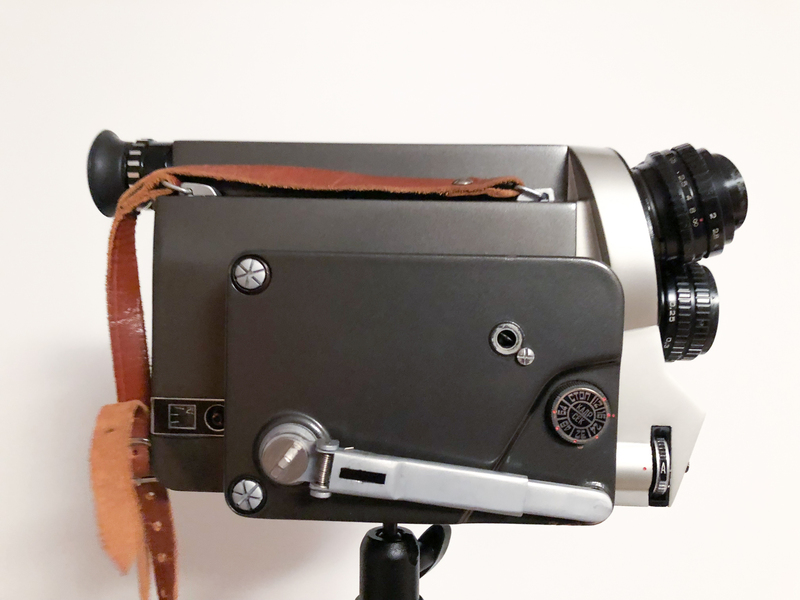 In short: If you do not want to buy expensive Bolex or if it is too bulky for you, the Kiev can be a great alternative. Through their use, you nurture and appreciate this unusual camera development and is rewarded with beautiful pictures abundant. This article first appeared in a similar form in the magazine Cine 8–16, Nr. 46, June 2018.